Orion Nautilus Motorized Filter Wheel 4 x 2"
Ideal for use with monochrome cameras, the Orion Nautilus Motorized Filter Wheel 4 x 2in is a motorised USB-controlled filter wheel which holds four 2" RGB/LRGB or other Astronomical filters. Ideal for use with monochrome cameras, the Orion Nautilus Motorized Filter Wheel 4 x 2in is a motorised USB-controlled filter wheel which holds four 2" RGB/LRGB or other Astronomical filters. This filter wheel is T-threaded on both the telescope (fixed) and camera side (removable) for attaching directly to suitably threaded focusers and cameras. 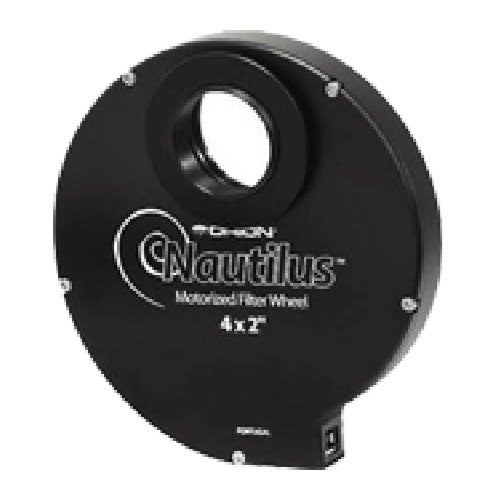 The Orion Nautilus Motorized Filter Wheel 4 x 2in adds a depth of 22mm to a focus train and comes with a removable 2" nosepiece fitting to ensure the greatest available field illumination of an attached camera's chip. Using a supplied key, filters are easily changed via a five bolt system. Common to all the Nautilus range is the self-powered USB connection, offering ASCOM automation - compatible with Windows 7, XP and Vista 64bit. Orion Nautilus Motorized Filter Wheel 4x2"